Do you want to install worpress at your hosting and servers then firstly you will surely like to edit all its sections and posts to make a complete site locally. Many people don't know that they can do like this by using Wamp Server Its quite easy and you will be able to run wordpress locally. You can try wordpress by installing it in your Local server which is not only just cheap, Its also fast compared to other live blogs. WAMP server is that windows software/application that makes it all possible. Below goes the short tutorial for installing wordpress in your Local server for windows with the help of WAMP server software. 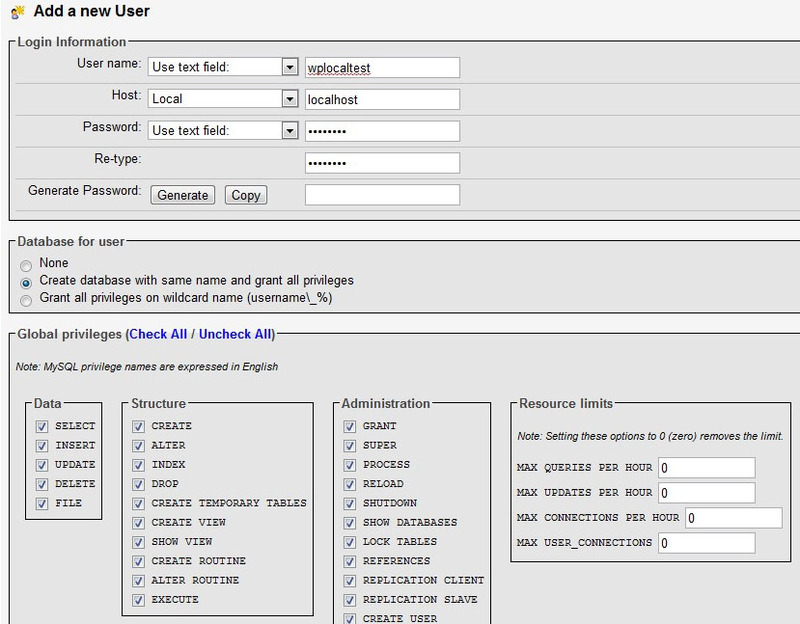 Wamp Server is a free application that allows you to create Web applications with Apache, PHP, and the MySQL database. It also comes with PHPMyAdmin and SQLiteManager to easily manage your databases. You can download Wamp Server for windows for free. After you download Wamp Server Install it into your windows directory and run the application. Now Click on the Wamp Server icon at the Taskbar and Click “Start all Services”. 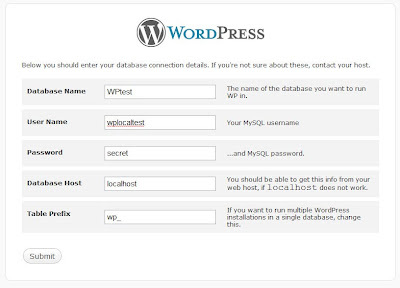 This is the second and also the most step for installing wordpress on Local server. It does require a valid database where the wordpresss data are stored. For this Goto http://localhost/phpmyadmin/ from your Web browser and start creating a database. 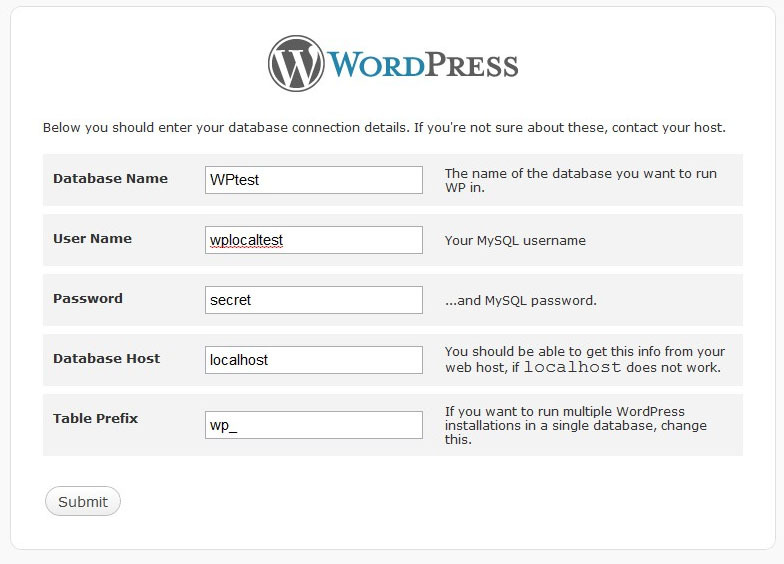 Create a new database for wordpress setup from your phpMyadmin homepage. You can give a desired name for your database. For instance I have used “WordPresstest” here. Now goto PHPMyadmin homepage with the help home icon on top left. Click on “Privileges” link on the homepage below the create database section. Now Click “Add a user” link in the Privileges page. 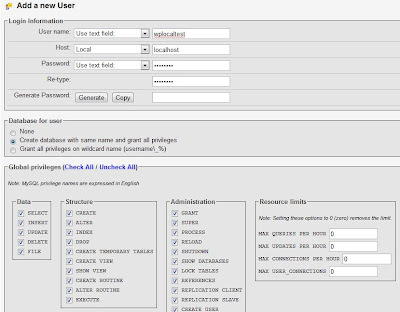 Now in Add new user page Choose your desired database Username and Password. Choose Local as your host. Check “Grand all Privileges…” for database for user and remember to Check all the Global privileges and Click Go at bottom right. The last step has finally arrived. 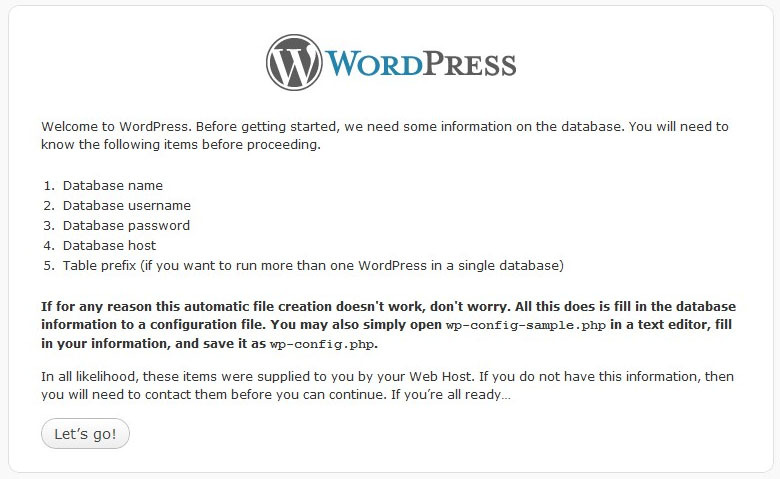 The first thing you do here is download wordpress from Official website. The next thing you should do is extract wordpress pack which might be in .zip or .tar format to “www” folder of Wamp Server Installed location. If you are Uncertain about the www folder location then Click the Wamp Server icon at the windows Taskbar and Click “www directory” . The first snapshot at Step 1 might help you get clear. Now enter http://localhost/ in your browser and click your wordpress folder. There will come a page for creating a Configuration file, Click the “Create a configuration file” button and there will come a wordpress Welcome Page. Click “Let’s Go” button and start installing wordpress on your local server. Here comes the most important step. Use the same details in the forms in this page exact that you have created/used above and Click Submit button. On the next page it will show that your wordpress site has made communication with the database. If it shows then Click on “Run and Install” button and if it show some errors then check your wordpress installation from Step 1. 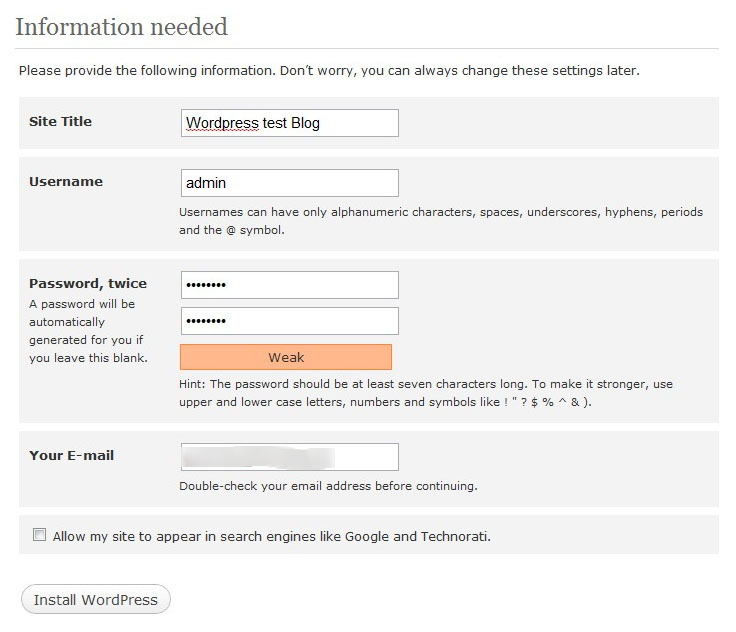 This is final step for the wordpress installation. 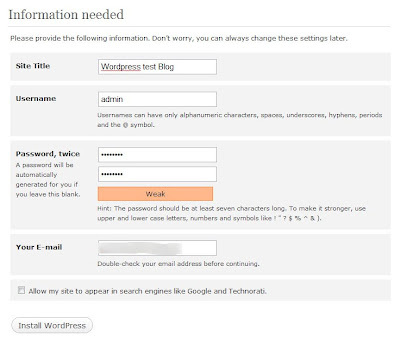 Enter your Desired wordpress blog title, wordpress username, your desired password and your Email address. Site it is a local Installation weak password doesn’t make a big sense and don’t check “Allow my site to appear in search en…”. 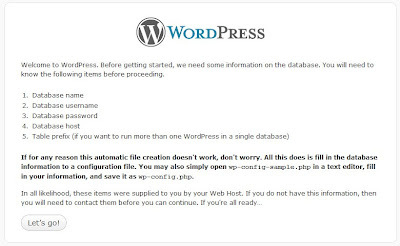 Now your WordPress installed is completed Successfully after you see this page with Success message.